Increase Safety Compliance & Reduce Jobsite Accidents! Numerous companies in the construction industry are realizing the impact of offering safety incentives on bottom line results. Construction companies are able to increase safety compliance and awareness on the job-site by providing a construction award program to workers who complete safety training and reach safety milestones. Construction employees and contractors work in dangerous job site environments every day and the potential for injury not only results in multiple expenses for construction companies but can also cost a person his or her life. 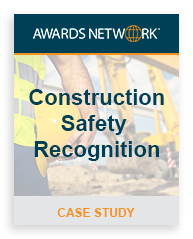 Awards Network works with construction companies to create a safety program that improves safety awareness and compliance while reducing the cost of insurance and worker’s compensation claims. A construction company decided to start presenting safety awards to employees who reached specific quarterly safety program goals. Monthly job-site safety training and safety meetings were implemented to help inform employees on how to work safely at various job-sites while keeping them up to date on construction safety issues. Each employee who reached the quarterly safety goals was presented with a custom safety award booklet. As the employees began to redeem the safety awards, management was provided with construction award program status reports, allowing the company to see tangible results of the construction award program without having to perform the day to day administrative functions. Want to learn more about how a construction award program can help to make your company safer? Contact Awards Network to discuss your construction award program needs.